Prominent & Leading Manufacturer from Hyderabad, we offer resistivity meter with built-in power source, proton magnetometer, dc resistivity meter and water level indicator. Resistivity Meter With Built- In Power Source to the clients. The products we are offering are designed to measure current and potential separately in one mode of measurement, while in the other mode it can read the resistance directly that results in reducing the users time for calculating resistance from current & potential values. Our range can send highly stabilized currents up-to 200mA and read the resulting potential with a 100 micro volts resolution or ground resistance directly with 50 micro ohms resolution. Magnetometer we make are highly portable field geophysical instrument that provide accurate measurements of the total intensity of earth's magnetic field. Working on the principle of nuclear magnetic induction, the magnetometer yields absolute values of magnetic field and is almost free from the temperature and orientation problems. The digital technology incorporated in the design and development of the instrument facilitates operational convenience, as also obtaining highly stable outputs, with a resolution of one gamma. 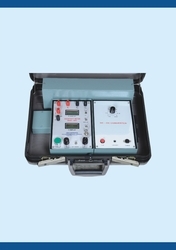 we are engaged in offering a competitive range of DC Resistivity Meter. 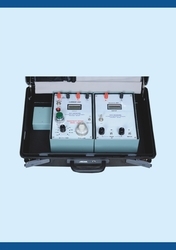 Our offered range come with two digital displays one used for reading the current sent into the ground and the other to read the voltage across the potential electrodes directly. This meter can send current up-to 1999mA into the ground and measure the resulting voltage with an accuracy of 0.1mV up-to a maximum potential value of 1999mV. Water Level Indicators /Dip Meter has a sensor attached to the end of a cable, wound on a winch is lowered in to the well over a calibrated wheel attached to the counter mechanism. The moment sensor touches the water surface, a panel meter on the winch shows full deflection with buzzer sound. The depth to the water level from the ground can be read off in metric scale on the counter. Our Water Level Indicator is very light and handy. 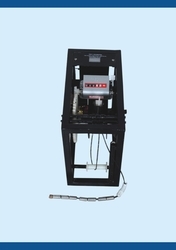 Its operation is simple and fast and can be used to check the water level both in open wells as well as in borewells.